Zebra’s popular healthcare-ready MC40-HC mobile computer will soon be available with the robust Android KitKat 4.4.2 operating system. Get a true enterprise mobile experience on a rugged, user-friendly device with the updated MC40-HC. In hospitals and clinics, mobile computers help nurses and lab technicians improve the quality of patient care and save lives by providing instant access to a wealth of business-critical information: real-time lab results, a change in a patient’s condition, or verification of the ‘5 rights’ of medication administration at a patient’s bedside. Mobility also helps healthcare organizations comply with government and health industry regulations, such as Stage 2 Meaningful Use and JCAHO, without tasking an already overburdened nursing staff and creating additional paperwork that would further reduce time spent caring for patients. 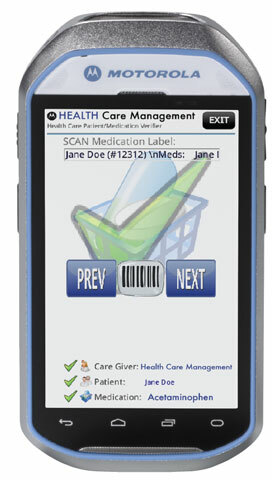 Healthcare staff members get the most benefit when they have the latest in mobile technology. A device that is as fun and easy to use as their own smartphone ensures regular use and integration into the existing working environment. An enterprise-class feature set, from data capture and security to manageability and dependably robust wireless connections, makes the MC40-HC an indispensable tool: Android, the most popular mobile operating system in the world; world-class enterprise data capture capabilities; and Extensions (Mx) from Zebra, which adds enterprise-required features that are missing from standard Android. For more information or to pre-order the new MC40-HC, contact one of our mobility experts at Barcode Discount.